Despite some regulatory hurdles, financial planners have long been identified as a key source of future reverse mortgage growth, particularly as the industry attempts to position the products as one potential part of an overall retirement plan. And when working with financial planners and clients, sometimes showing the cold, hard data can be the most convincing. A webinar held earlier this month by Reverse Mortgage Funding showed how modeling software can more accurately help financial planners determine whether a reverse mortgage should fit into a client’s retirement plan in order to increase their probability of success. 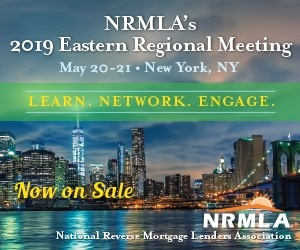 The session encouraged participants to view reverse mortgages, as well as the software, as valuable wealth management tools for clients most likely to benefit: homeowners aged 62 or older with at-risk retirement plans and no long-term care insurance who are still making mortgage payments. “Reverse mortgages are something planners are becoming more and more interested in,” Timothy Jackson, the head of financial planner education and support for RMF, said. He hosted the August 16 webinar using eMoney, a popular financial planning software program. The presentation provided common methods advisors are using to demonstrate the financial impact reverse mortgage funds have on a client’s retirement income plan. During the webinar, Jackson modeled common uses of reverse mortgages among advisors —a credit line to eliminate an existing mortgage balance being the most prevalent. The advisors learned how, under the right circumstances, reverse mortgage proceeds can increase both cash flows and in some cases legacy values. In one scenario, a couple was considering refinancing their current $208,000 mortgage into a reverse mortgage to eliminate principal and interest payments. Jackson modeled the difference between either continuing to make payments or refinancing into a HECM and allowing the reverse mortgage debt to accumulate, highlighting the impact of each on the client’s plan. Navigating the intersection between financial advice and reverse mortgage originations has always been particularly tricky, with restrictions against cross-selling other financial products — such as annuities or insurance — prompting many advisory firms to issue blanket bans on discussing HECMs with potential clients. Earlier this year, for instance, an advisor shared his story of receiving a fine after recommending a reverse mortgage to a client. But the financial-planning connection, when handled correctly and without pressure to purchase certain investment products, can be a main referral source for HECM originators. “If we can demonstrate that a client is at risk of not meeting their goals, it makes a very compelling story for the advisor to provide to their client,” he says.